Frank's Raised A TOTAL OF $85,036! From Left: Hopecam Founder and 2X RAAM Competitor Len Forkas, 5 year old Hopecam kid Drew and Frank Fumich. Frank Fumich Raced For A Reason! He participated and completed Race Across America (RAAM) on June 12th, 2018. RAAM is a 3,089 mile solo cross country bike race from Oceanside CA to Annapolis MD. 6633 Arctic Ultra - A non-stop, self-supported 350 mile foot race taking place north of the Arctic Circle in Canada. It’s billed as the toughest, coldest, and windiest ultra race in the world. Frank and friend were the first Americans ever to finish. Badwater 135 - This non-stop 135 mile race called "The World's Toughest Foot Race" is run in Death Valley in July when tempts often hit 120 degrees. 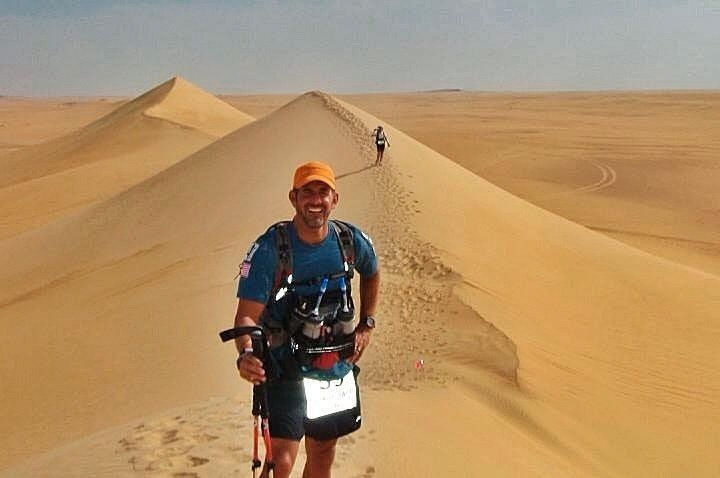 Racing the Planet's 4 Desert Series - A 150 mile, self-supported desert races over 6 days in the hottest, driest, highest, and windiest deserts in the world. Thank you Frank Fumich for racing across America and being our Hopecam Champion to help Hopecam defeat social isolation and put more smiles on the faces of children fighting cancer!